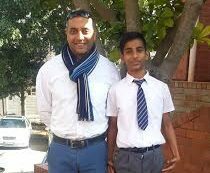 Overport SRS learner, Mohammed Anaas Khan, did his school proud when he was selected for the Durban Invitational U13 Cricket team. The talented learner will be attending practice sessions between 21st August and 11th September 2015 in preparation for the U13 KZN Cricket Festival . This Festival , which will be held from the 19th to the 21st of September 2015 , serves as the KZN U13 Cricket trials. Well done Ahsan. You have done us Proud especially since our school has limited cricket training facilities. Well done to Mr. Mather too. Good stuff..